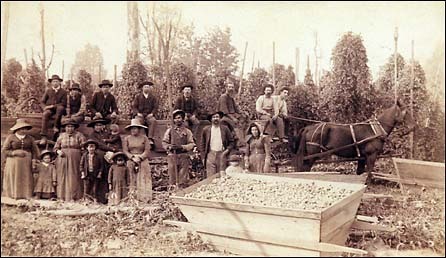 Growing hops was important to the development of Puyallup. Pioneer Ezra Meeker was known as the hops king of the World when this photo was taken about 1890. The hops boom went bust in 1891. When settlers first began arriving in the valley in 1854 they found the valley floor consisted of dense strands of cedar and cottonwood trees, with often dense brush that was very difficult to remove with the tools available to them. Many of the first settlers continued to search for land elsewhere, unaware of the rich soil that lay beneath the brush. Ezra Meeker and his brother were among the first to arrive. After inspecting the valley, he at first rejected any notion of living in the valley, writing that it would take back breaking labor to clear the land. As settlement in the valley started to take hold, settlers did work hard to clear enough land for a cabin, and to grow some food to sustain their families. Then, in 1855, Indians in the valley became increasingly dissatisfied with treaties being forced upon them by the U.S. government. They destroyed all but one of the settlers homes. Many settlers did not return to the valley. The settlers that remained were in dire financial need. The Meeker’s had suffered the greatest. Not only was property destroyed in the valley, but their mercantile business in Steilacoom had failed too because merchandise ordered – sank in a shipwreck on its transport to Washington. The money to buy the supplies had been borrowed, leaving the Meeker’s in desperate financial need. At that time, another Meeker relative had been persuaded by a friend in Olympia to attempt to grow hops on his land, a thought that seemed crazy to most residents. On his way back to Sumner, he stopped off at Ezra’s cabin to drop off the hop roots. Ezra planted the roots among the tree stumps around his cabin, on the land that is now Pioneer Park in downtown Puyallup. From those few roots, Ezra Meeker made $157.27. In the 1800’s, that was like striking gold. The word about the “crop” spread quickly, and soon every farmer in the valley planted the Hop roots. Hops quickly become Puyallup Valley’s biggest cash crop. During the next quarter century, hops brought the valley more than $20 million, making Ezra and his family wealthy. Ezra became a hop broker, and frequently traveled the World marketing the valley’s hops. Disease and mildew finally put an end to the crops. Today we know the Puyallup valley for it’s daffodils, but it is the hops that started our history, and gave original valley residents the wealth, fortitude and persistence to stay in the valley and to shape our future. The Grandiose Hotel that never was…One of the most talked about buildings in Puyallup in 1890 was the Park Hotel. The structure was to cover an entire block and would have been three stories high. It was to be built with an anticipated $40,000 from the booming hops industry. The construction of 83 luxurious suites, an adjoining restaurant, and the possibility of an additional 40 rooms, was well underway when the hop boom went bust. The hotel was never completed. After years of disrepair, the structure became “home” to unsavory individuals who used the building as a sort of flophouse. The amount of “guests” became larger, and the inhabitants began terrorizing the community for food and money. Finally, Washington States Governor came from Olympia and finally persuaded all to go home. For awhile afterwards, the building was used to store bailed hops, but the building had no other uses and went into further disrepair. Finally, a group of local citizens bought the building and property, and soon began to demolish the shell of a building that was to become Puyallup’s grandest, most beautiful building. What's with the name, Puyallup?